For several decades Africa was regarded as a continent dependent on western aid. However, within the last years and more innovations from Africa the picture is changing. The continent is changing: Today Africa is generating innovations that are relevant to international markets. The introduction of a mobile payment system from Kenya, M-Pesa, in Romania clearly illustrates this paradigm shift. Innovations from Africa could become even more relevant in the future. Both mobile services as a basic infrastructure and the continuous increase of fast and powerful Internet access capabilities have played an important part in this. In 2012 Africa’s annual economic output rose by 4.7 percent – constant economic growth and increasing investments are anticipated in coming years. These developments promise to drive innovations from Africa in the upcoming years. 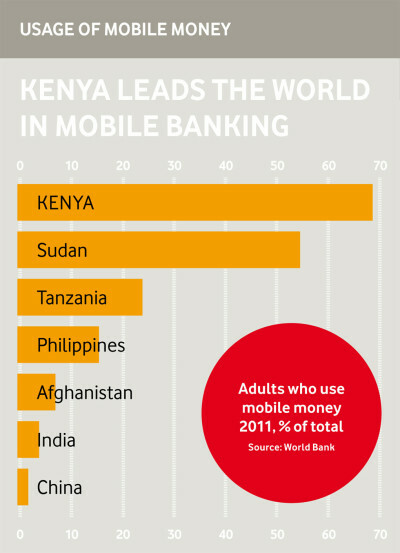 Kenya leads the World in the usage of mobile money. Beyond the economic success stories, an aspirational technology scene has grown up on the continent. Kenya’s capital Nairobi, the birthplace of M-Pesa, has established itself as the “tech centre” in Africa within seven years. The rise of M-Pesa as one examples of the innovations from Africa is impressive: in 2007 the local mobile services provider Safaricom in partnership with its shareholder Vodafone launched a mobile-based money-transfer service as a non-profit project. Just six years later a third of Kenyans (17 million people) were using their mobile phone to transfer or save money. The project’s success and the national and international attention it attracted as a result are considered to be particular catalysts for the differentiation and professionalisation of the Kenyan tech scene. The interplay of “from above” (a mobile services company that drove innovations forward) and “from below” (individual actors interested in technology) facilitated a culture that was unique in Africa at that time. An economic and social climate emerged in which resources could be pooled and the key thinkers of the Kenyan tech and start-up scene cooperated to offer mobile services and use mobile technology as a distribution channel. The opportunities for developing innovative products in Africa are particularly wide-ranging: Successful apps such as the mobile learning software Eneza, m-Farm, a service for farmers, and the medical information service medAfrica illustrate the cross-sector potential of innovations from Africa. 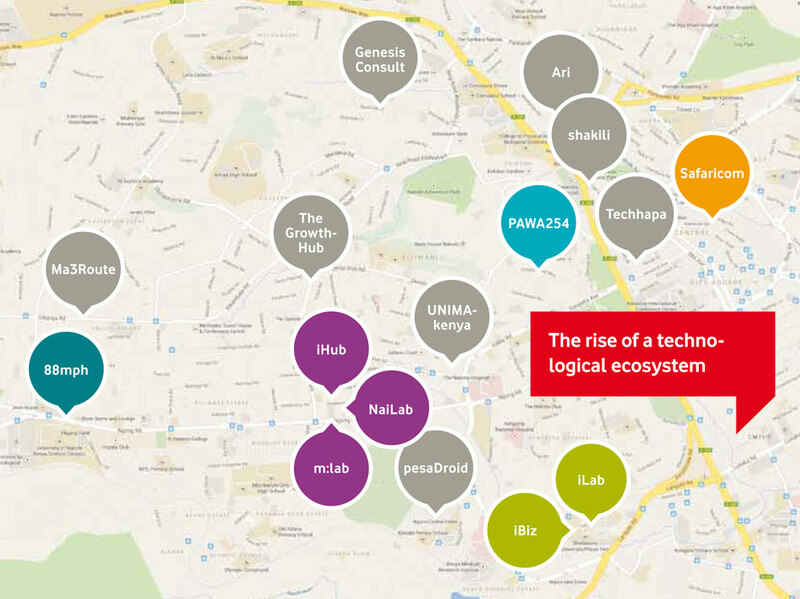 The rise the technological ecosystem in Kenya. Despite these impressive developments, the challenges remain substantial: Kenya’s tech ecosystem is young and still unstable. The success story of M-Pesa has yet to repeat itself. More innovations from Africa have to prove their potential. The media-inspired nickname “Silicon Savannah” makes it difficult to discuss the potential of the Kenyan technology sector objectively. In fact, the framework conditions for entrepreneurship in Kenya are considerably less favourable than in the western world and setting up a profitable company entails enormous risks. Funding instruments from the western technology sector cannot be transferred one-to-one. Development organisations and companies should commit themselves as investors or provide start-up grants as part of longer-term funding programmes. Equally, they can act as intermediate organisations for the distribution of micro-funding to reduce the transaction costs for investors. Incentives need to be created for investors and business angels for example by the government in order for micro investments to be made. Business angels should be specifically targeted due to their non-monetary support. Universities must promote funding concepts that correspond to the specific requirements of start-ups in developing countries. Investing in innovations from Africa means investing in future potential. Investors who enter the market expecting a short-term reward have little prospect of success and send the wrong signals to future company founders. Instead, investors should provide long-term incentives for entrepreneurs and enable sustainable business models. Kenya’s population is comparatively young and has an enormous willingness to operate entrepreneurially. 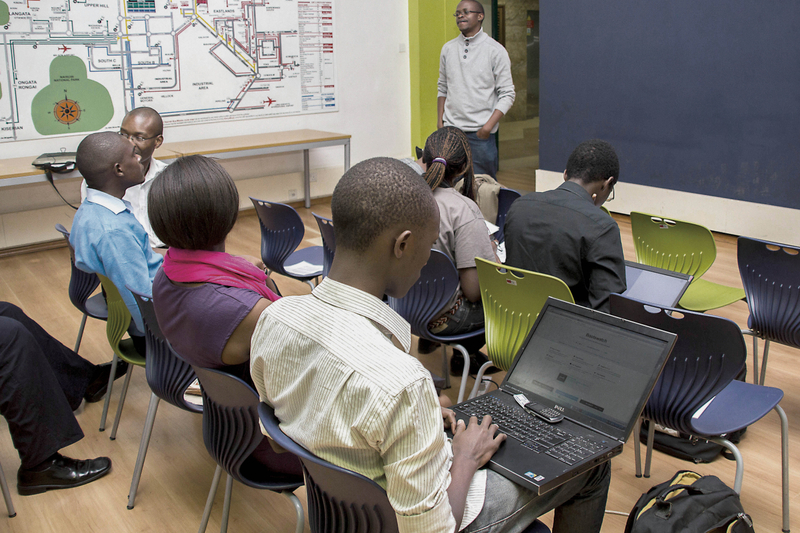 Kenyans are increasingly acquiring programming skills. However, very few have the relevant management knowledge to successfully realise business ideas which could boost innovations from Africa. Here are some examples for challenges when doing business in Kenya by Ajaja Joshi. Governments need to substantially improve the import and export conditions for hardware as the basis of a technology-based economy to drive innovations from Africa. Development organisations should promote programmes for expanding competence in the area of hardware production.